1.Preheat oven to 150 degrees Celsius. Place egg whites in a bowl of an electric mixer and whisk on medium speed until soft peaks form. Gradually add sugar, whisking on medium speed (beating at this speed will make sure that the meringue won’t split and will dissolve the sugar properly). Once all the sugar has been added, continue to whisk on high speed until stiff and glossy and sugar is completely dissolved. Test by rubbing your fingers together with the mixture. If it’s still gritty, continue to whisk. Fold through the cornflour and the vinegar and whisk until just combined. 3.Reduce the oven temperature to 120 degrees Celsius and bake for about 1 hour 20 minutes. (the pavlova should be dry to the touch) Turn the oven off and allow the Pavlova to cool completely in the oven. 4.To make the Chantilly cream, beat the cream, vanilla and sugar until soft peaks form. 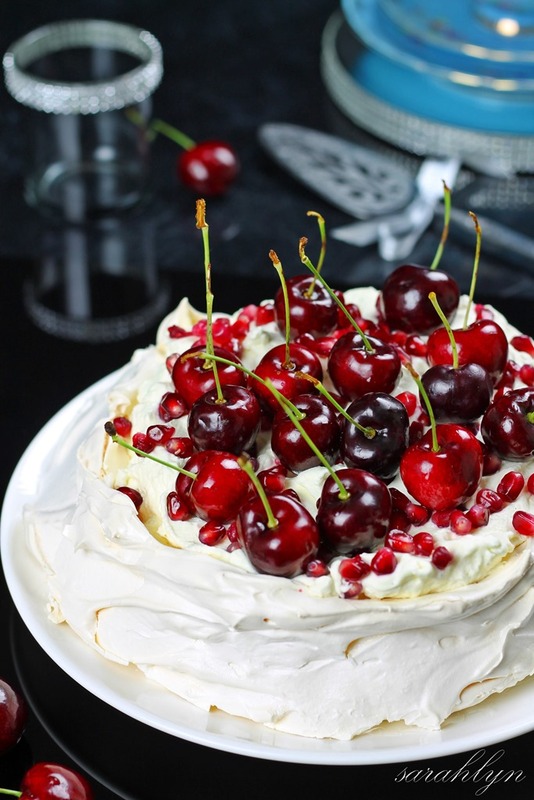 5.Transfer Pavlova onto a serving plate, top with Chantilly cream and decorate with pomegranate seeds and cherries. Serve immediately.